Take a hike—in Door County that is! Don’t let those new muscles go to waste! Now that you’ve spent almost two semesters trekking up and down Bascom Hill, building up your cardiac strength and sculpting your calves like a Greek god’s, you might as well keep up your stamina. Wisconsin’s Door County could be the solution. Home to five state parks, 19 county parks and 11 lighthouses, this picturesque peninsula is a great place to get away and enjoy hiking, biking, kayaking and other outdoor exercises without breaking the bank! Here are three popular places to interact with nature in different areas of Door County. 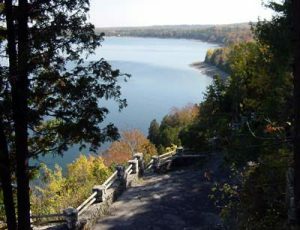 Peninsula, Wisconsin’s third largest state park, is perhaps the most well-known park in Door County. 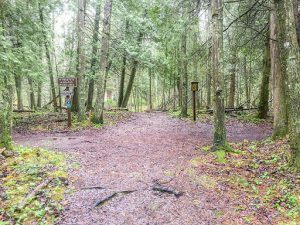 It has numerous hiking, biking and ski trails, campsites, a beach, bluffs, a lighthouse and eight miles of Door County shoreline to explore. Newport protects 11 miles of Lake Michigan’s shoreline and is the only wilderness-designated state park in Wisconsin. In addition to its shoreline and hiking trails, Newport State Park was named a “dark-sky preserve” in 2017 by the International Dark-sky Association (IDA), making it perfect for late night stargazing. 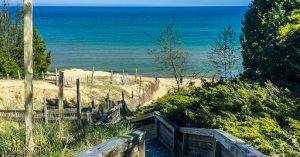 Whitefish Dunes is known and named for its sand dunes, preserving the “most substantial” dunes on the western shore of Lake Michigan. The park’s hiking trails allow visitors to be close to and explore these natural beauties. No matter what park you visit or what trail you travel, the places to explore in Door County are endless–and each one is more beautiful than the next.